A New Map of Nova Scotia, Newfoundland & c., From the Latest Authorities. An exceptionally beautiful example of John CaryÂ's important 1807 map of Nova Scotia and Newfoundland. Covers the Maritime Provinces from New Brunswick and the Mouth of the St. Lawrence eastward as far as Newfoundland. Shows many of the offshore Cod Fishing Banks that made this area an important fishing center for hundreds of years. 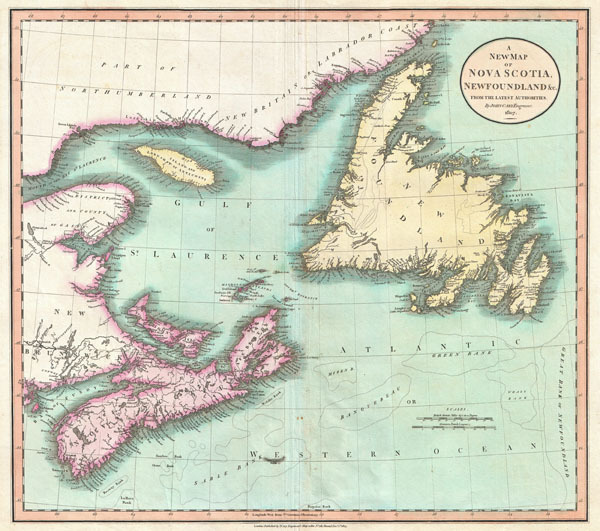 All in all, one of the most interesting and attractive atlas maps of Nova Scotia and Newfoundland to appear in first years of the 19th century. Prepared in 1807 by John Cary for issue in his magnificent 1808 New Universal Atlas. Very good condition. Minor verso repair and reinforcement to riginal centerfold. Blank on verso. Rumsey 1657.054. Phillips, P. L., A List of Maps of America in the American Library of Congress, p. 625. Phillips (Atlases) 714. The Map Collector, issue 43, p. 40-47 (Atlas). National Maritime Museum, v. 3, no. 311.